Yamaha Motor's Automobile Engine Production Reaches 3 Million - News Releases | Yamaha Motor Co., Ltd.
IWATA, June 16, 2014– Yamaha Motor Co., Ltd. (Tokyo:7272) produced its 3 millionth automotive engine. 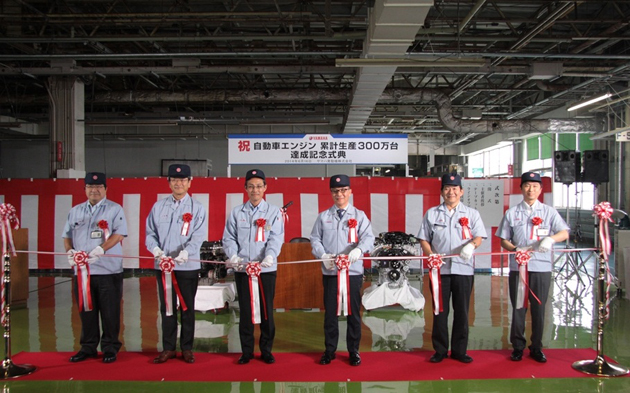 To mark this milestone, a ceremony was held at its Iwata Main Factory, where these engines are assembled. The ceremony was attended by Takaaki Kimura, the Senior Managing Executive Officer and Representative Director of the Company, as well as around 200 representatives from the Automotive Business Unit* and the Manufacturing Center. The company's automobile engine business began in 1964 with joint development and production alongside Toyota Motor Corporation on their Toyota 2000GT (released 1967). Currently, Yamaha Motor focuses on developing and producing automobile engines for various car manufacturers. In addition to Toyota Motor, to date the company has also supplied engines to Ford and Volvo. Yamaha Motor's strengths lie in its motorcycle technology, which allows the ability to produce high-revving, lightweight, and compact engines. In recent years, Yamaha Motor was in joint development and production of the V10 Engine for the Lexus supercar LFA; and it currently supplies the 2.5-liter V6 engine for Lexus IS/GS, Toyota Crown, and Toyota Mark X. Prior to the current milestone of producing 3 million automotive engines, Yamaha Motor produced its 1 millionth engine in 1989, and its 2 millionth in 2005. *	The Automotive Business Unit carries out development and manufacturing of automobile engines as well as suspension systems and products that utilizes relevant technologies.